I recently wrote about an example of what not to do if you want your learners to feel included and your content to be accessible. It had to do with differentiated learning and not being told upfront what that meant. Harumph! (e.g. I’m tired, it’s the end of a long day and you, the presenter, have just lost my attention by not explaining a term). Funnily enough, a few days later, this time with my other kid, I was presented with a great example of access and inclusion. Let my explain. My youngest is interested in cooking. Let’s just say this, he has his own frying pan and spatula (not to mention other cooking items that are overtaking our kitchen). As part of his Christmas gift I’d arranged to take him on a behind the scenes tour of a culinary arts program. His eyes were almost as big as the many frying pans we passed as we went from kitchen to kitchen, touring the school. 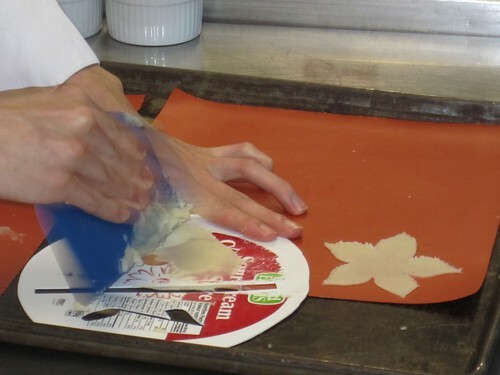 At one point we saw students cutting out decorations and carefully setting them aside for baking. We stopped and talked to the instructor and received a great mini-education on tuiles. Voila! Great mini lesson. Great example of satisfying our curiousity (learner curiousity being a trainer’s best friend). And great example of being inclusive (here, let me explain this to you) and accessible (watch, ask questions, I’m here for you). Pulling a rabbit out of your (training & development) hat. Is it magic? Hail the Tuiles! I am very jealous and recognize the learning that happened . . . magical when it works and student and teacher, al learners together, connect. Hmm envious of the tuiles or the learning. Both were great. Yep, magical. Here’s to more magic! Do you have a particularly magical learning moment? Which leads me to more ‘hmmm’ [deep thinking] – there’s a new blog post in there somewhere.